Our lego fanatic (aka Burke) had a Lego Table on his Christmas wishlist. Of course, they are $150 (and totally DIYable), so we decided to make one ourselves instead. Making the Lego table itself is pretty self explanatory- assemble a small table (we got a white IKEA Lack table for $8), gorilla glue four Lego base plates to the top (be sure to add legos to all of the seams so that the spacing is correct- pushing the base plates all the way together makes for the wrong spacing). My favorite part of this project, however, were the ‘extras’ we added on each side. On one side, there’s a row of hanging buckets- perfect for storing project leftovers (or waiting-to-get-to’s). 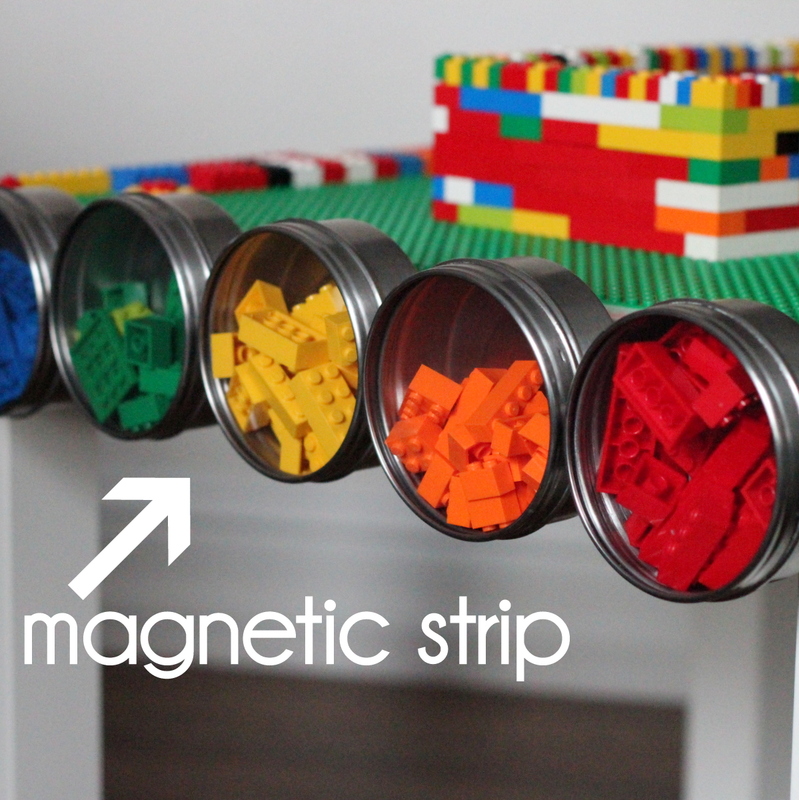 And on the other side, there’s a magnet strip, complete with magnetic tins for extra lego storage. I think these tins will eventually become ‘homes’ for all of Burke’s lego guys (providing a way for all of their ‘accessories’ to stay with them and also protection from our littlest lego afficianado, Piper Jane). The lego table has been one big giant hit with the cousins (today, they made a castle and a dragon and a dragon-fighting army). It is so fun to watch. And since the total project cost was less than $50 (including the table, the base plates, the magnetic strip and the hanging bins), we are loving the savings as well! Do any of you know a Lego fanatic? Does this obsession stop any time soon (Burke is four)? My son is 11 and still loves Legos. We have bins and bins of them. Some are from when my husband was a boy. He’s always coming up with new creations. Hey Kirst .. Happy New Year! Hugs to Adam and the kiddos! Dylan, Dustin and Caurie have been seen playing with our gigantic box of Legos well into their teens (don’t tell them I told).. Dylan has even made movies using them … They are the best toy. I love your table! LOVE YOU TOO! Happy New Year! Hey! Love this! I was wondering what the dimensions for each base plate is. Are they the 8×8? Or 15×15? Thanks in advance! I think they’re 10×10 sized (is that an option?). Hope that helps! I LOVE this! Legos are such a awesome toy. We too have tubs and tubs of them. Sean and his friends just used them a few weeks ago to build cars and video crashing them into each other! Such a timeless toy! One additional question….. where did you find the hanging buckets? Love the table kristin, i am trying to build one for my daughter, and was wondering where did you get the rail for hanging buckets, checked ikea, but seems not to find the right size. I love this table! I want to make one! I have a few questions. I found all the items on Ikea but my table is a little bigger and was wondering if could give me the measurement of the part you screwed into the table for the bar with the hanging containers. I just want to make sure it fits before I order it online! My son’s are going to love this! Also did you use the magnetic knife rack with the containers? Hey Alex, just saw this! We just moved overseas and the lego table is now in storage, so I can’t measure for you- sorry! And yes, we used the magnetic knife rack and with containers! i love your table and found most of the stuff you used on ikea . so i am having hard time finding the magnetic strip for these containers do you have any suggestions ?? Hey Dalia- I think I used the grundtal knife rack and it works fine (unless there is another at IKEA as well). Hello! 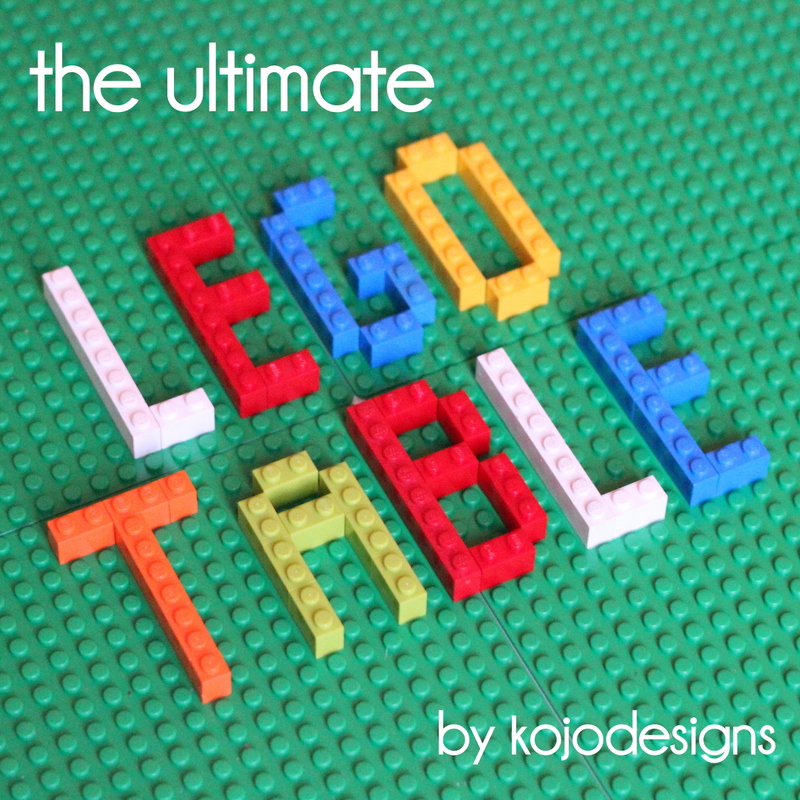 I have an almost 4 year old who is asking for a lego table and your idea is perfect and adorable!! I am going to “borrow” your idea for Christmas, but had a question….the rail that you used for the hanging buckets I am assuming is the “Grundtal” Rail ($7.99) but it is longer then the table is wide. Did you cut it or use a different one so that it fit perfectly on the table? Thanks for the great idea!!!! My son is nine and there is no end in sight to his Lego obsession. He’s moved on to the ones with robotic features, but still loves anything with minifigures. Good Luck! Love the table idea. I need big bins at this point though. Oh check out the lay n go. It’s at the top of my storage wish list. I actually bought a lack table for just this purpose, but never finished the project because base plates are $20 (+tax) around here. Curious where you purchased yours! Hey Tanya- I got mine at the Lego store (it was $24 for all four). I saw them on Amazon as well, but they were cheaper at the Lego store. Hope that helps! It never ends and just gets more and more expensive as they want the really big kits. The Lego company is a marketing genius since they developed animated cartoons to go along with certain sets. My son and daughter both love Ninjago. I have a 900+ piece set to help my son put together today! And we have Lego’s EVERYWHERE as well (I am certain it’ll just get worse too). 🙂 Totally worth it, though- definitely my favorite kid toy. 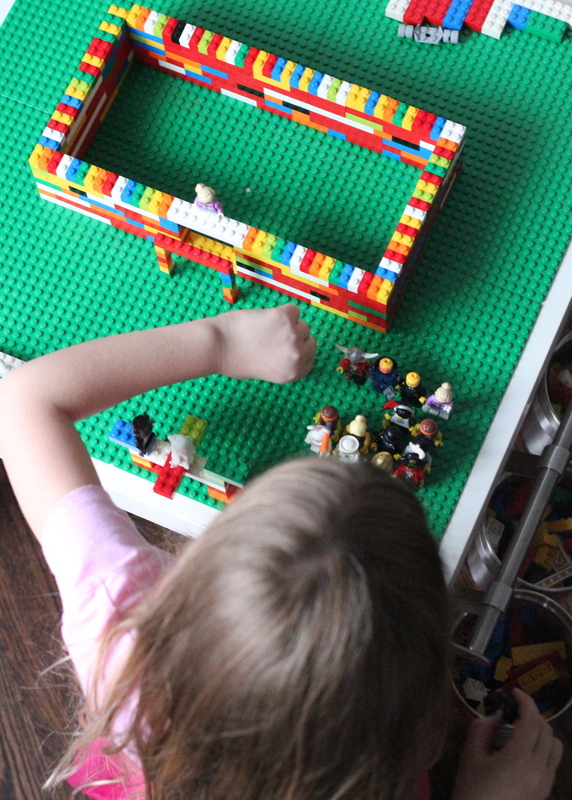 Oh, and I love the Lego table idea, but I know it would not stay organized at my house. Legos are literally in every floor in our home! So cool! I loved playing with legos as a kid but haven’t really gotten the ‘real ones’ yet since I have my 2 year old around too…just got them some wooden blocks for Christmas and those seem to be doing the trick. But when it’s lego time, I’ll definitely be remembering this project! Awesome. I love your table! I had my husband make the same one for my 6 year old son for Christmas. I like that it is a little smaller and SO much cheaper. I like the hanging bins on yours. Great idea! Krista, so much cheaper, right? So fun that you guys made the same thing for Christmas! I have four boys, 14, 12, 7 and 5 and our house should be made of lego’s we have so many. Your sons obsession will not end any time soon – my 14 yr. old just spent $200 from Christmas to buy a robotic truck – it just keeps getting bigger and bigger. I’d like to see storage solutions or lego bookcases – ways to display them on future blogs. 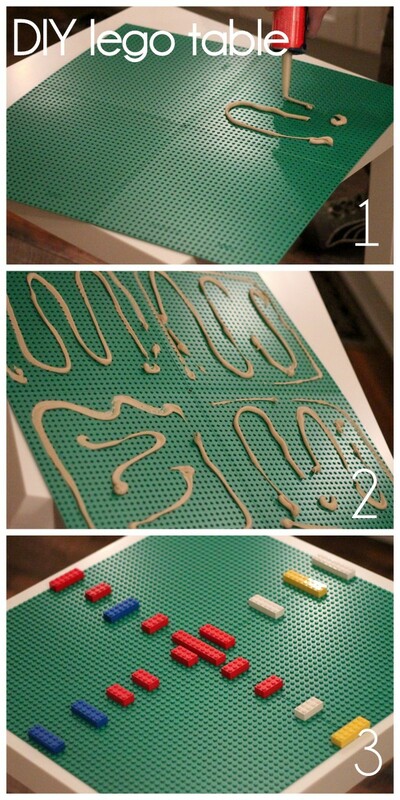 Wish I had thought of making our Lego table years back – would have saved me some $$$$! Thanks – great job – and have fun! My Lego fanatic (the eldest of my three sons) is 30 and living in Dallas, a long way away from us. Every time he comes home, I notice some Legos (being saved for grandchildren) have gone missing. He was married last September, and my husband found a bride and groom Lego cake topper. The photographer had a fit over it and included it in several pics. Minutes before he was married, he was putting Legos together!!! I also need to add that he earned degree in Building Science from Auburn University and works in that field for a large firm in Dallas. You can’t provide a better toy for your children or grandchildren than Legos! We are Lego fanatics in this house! I am going to make this Lego table!What did you use for the bins? My seven year old loved the magnetic strip idea for this lego people. I am so excited to get started on this! The bins are from IKEA (I think Grundtal is the name?). Glad you’re making one too! So excited to make this for my boys! Thanks for the idea! I hope this helps keep those pesky Legos contained! Kristin, love the table exellent idea. Trying to make one for my daughter and i was wondering where did you find the rail, i search ikea, can’t find the right measurement. Love the hanging baskets, great idea. I love it that you’re making one of these right now! I am so going to do this for my 7yr old. Hope its not too small for him :\ he has ADHD & I think this will be a great way to get him to learn to focus. Thanx for the great idea!! Hi, Wondered what size ikea lack table you got. Is it the side table? Is there a certain size lego plate or are they standard size? Will I need four to fit the side table? Thanks a bunch!! Can’t seem to find the rail and hanging buckets anywhere. Hmmm, they’re called Grundtal I believe. Hope that helps! Love all of this! I agree- they really are fabulous toys! I’m 31 and I still play with Legos. This is awesome! I’m super excited to start making a larger version for our kids for Christmas. Thanks! How did you attach the “extras?” Thanks! Hey Beth- we followed the IKEA instructions for attaching the hanging bar and magnet bar on a wall, but just attached them to the side of the table instead. Hope that helps! Hello! Unless I’m missing something, I still can’t seem to find the size of Lego plates I need to get. Are they the 10×10 or the 15×15? Thanks so much! Hey Joanna, they’re the 10×10 ones! Was wondering how much you spent for the whole thing including the glue? Hmmmm, the LACK table was $8 and the lego plates were $20 ($5 each). We had the gorilla glue on hand (I think it’s $3 or so, though) and the buckets/magnets/bar were leftover from a project we did in my studio (I think they’re on IKEA’s website?). So $30 without the hardware. Hope that helps! Hi. I’m trying to figure out cost but I see that the hanging buckets themselves are $9.99 each, that is without the magentic Grundtal rail ($9.99 for the 31 “, $7.99 for the 23 “). 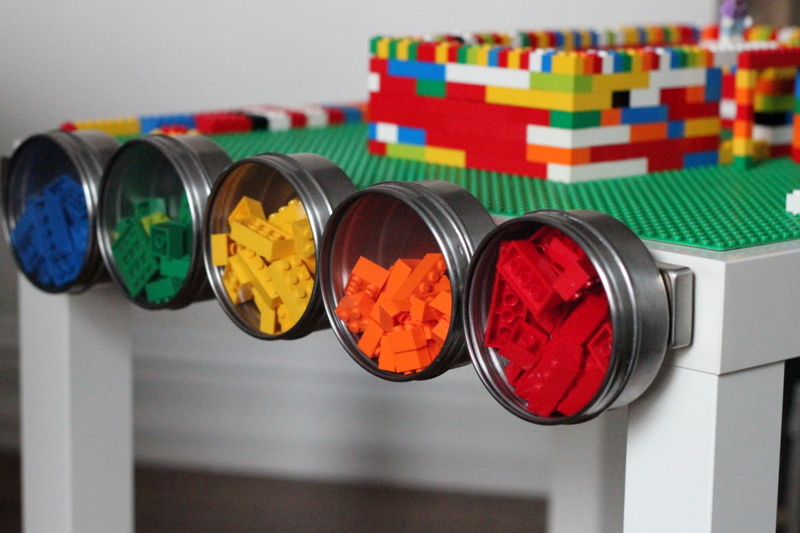 So without the table, and lego plates themselves and just doing one side of this (not including the magnetic rounds you have on one side) if I wanted to do a few baskets and the rail, I’m thinking that is already at least $50). I’m just trying to figure out because in your original you said this cost about $50 total to make? Hey Tara! 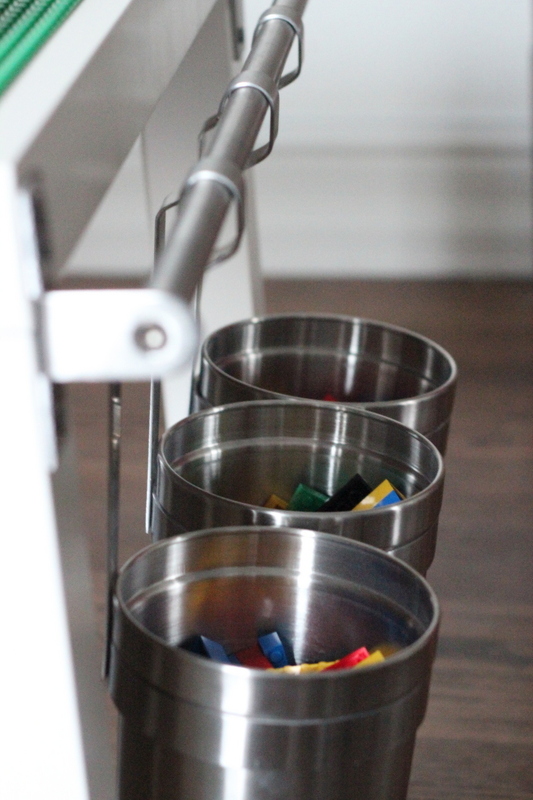 I can’t remember exactly what the prices were (I made this a few years back), but if you did it now it looks like it’d be about $85 ($10 for the rail, $30 for three buckets, $9 for the magnetic rack, $8 for a three pack of magnetic containers, $8 for the table and $20 for a 4 pack of baseplates on amazon). Hope that helps! I love this table & wish we had built this years ago. My son is now 14.5 and still loves Lego. He is hoping to exhibit at BrickFair and I hope we can make that commitment of time. Good Luck with your kids – Lego is a great hobby for life! I love this- it IS such a great hobby! This is a great looking table! I am making one just like it. Where did you purchase those buckets? I found these but they are a bit smaller than I would like. http://www.ikea.com/us/en/catalog/products/10271091/?query=102.710.91 Thanks! Oops I’ve seen the flaw in my previous plan. It would be too short, but I found another rail that is 55cm. Not sure if it will still need to be cut. In response to your question, my 25-year old son set up Lego scenes when he was visiting home before his deployment to Afghanistan. Also, my 29-year old son-in-law still collects, and builds with, Legos. So, I don’t see you getting past this “phase” anytime soon. I keep the Legos easily accessible, and the 25-year old Army officer is my youngest child! I’d have to second that! When the Legos are gifted at Christmas, my son and son-in-law, 32 and 37, are right in there with the kids, ages 13, 4, 3, 2, all building away and having a great time doing it! It’s something you’ll keep forever. I love your Lego table! Where did you get the rod you used to hang the buckets? Also, where did you get the buckets? Where did you find hardware for the sides? Hey Lee, I found the hardware at IKEA. Hope that helps! Hi, where did you get the ‘extras’? Home Depot? Hey Jen, I got them at IKEA. Hope that helps! Where did you find the hanging buckets? Hey Meagan- I found them at IKEA! Hope that helps!